I've been working on this back-burner project for a little while now. I've figured out a way to put a Series 1 wide scroll pump on a series 2. Planning to start this with my Camaro, if it works out like I think I'll update pictures and such, do it to my Bonneville, and a few other cars for a few people I know that would benefit from it. The biggest differences I see between the LG3 timing cover and the series 2 cover is that the lower heater hose port is way different and the hose piece it uses hits the power steering pump. I'd have to double check, I think the cam sensor location was different too. I think the L27 timing cover moved the cam sensor to the same location as the series 2, I don't have one just sitting around to check it's exactly the same, but it's really close. But the lower heater hose port has the same issue, points straight back into the power steering pump. While those are not impossible challenges, you're basically reworking the entire lower heater hose area in a way that basically screws anybody else over that has to work on it, and I'd bet you'll spend way too much time on it. After taking some measurements however I think I found a better way, not reliant on spending a bunch of money and time finding and modifying a stupid timing cover (which requires welding to do it right). The thrust plate for the oil pump is the same across the series 1 and 2. The pump itself looks like it's OD is 0.3mm (0.011") larger. I need to check 'new' parts to verify, but that might just be due to wear. The pump sections have the same pump pattern machined in them - the series 2 internal piece fits the series 1 external piece perfectly. 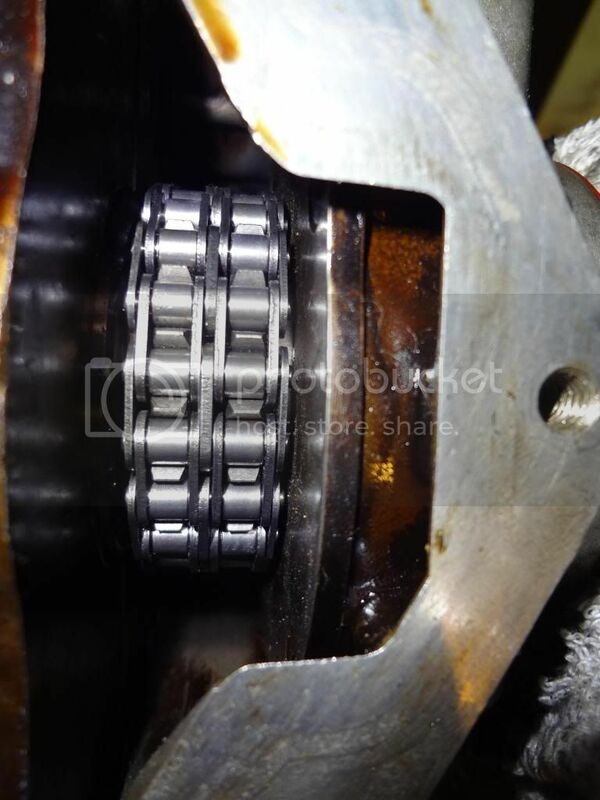 The crankshaft nose that drives the timing sprocket is the same between series 1 and 2. LG3/LN3/L27 share the same oil pump that is 1.8mm wider than the series 2+. The series 2 oil pump drive grooves are different than series 1. So what I've settled on tries to re-use as many parts as possible, buying as few parts as possible, and machining as little as possible. Melling K135 - LG3/LN3/L27 oil pump repair kit. Comes with a new oil pump, thrust plate. All your old parts that the above replaces. First, you need to get your old thrust plate reduced to 1.8mm thickness (flatness tolerance very tight) and then bore the center to 89.8mm ID (about 0.030 over the OD of the pumps which are 3.5"OD). You will probably need the help of your local friendly machine shop, I can't tell you shop rates, but I expect this to be the most expensive part of the process, probably around $100, and is likely cheaper than making something new from raw stock. What is critical is that it clearances the oil pump OD and that it's flat. Anybody that's ever removed their old one can see just how worn out and grooved the OD of the pump can get without adverse effects, so I don't see .030 clearance being a problem. Basically you're turning it into a spacer plate to take up the 1.8mm difference. 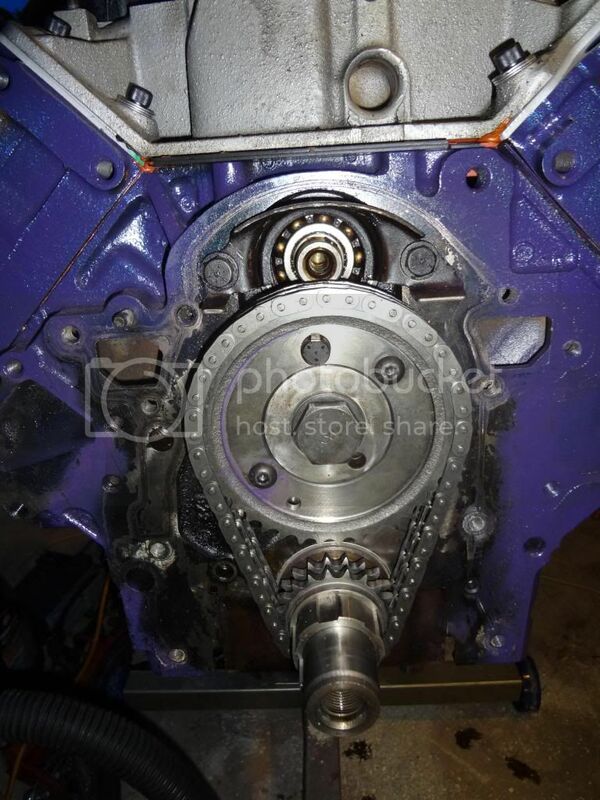 You can then install the oil pump repair kit with the spacer in your timing cover. Half-way there! Next, cut off the timing chain teeth from the Cloyes S729. All you need is the complete pump drive section, ideally it should be machined so the cut end is square, but I'm sure the creative among you would find another way. If you have a SINGLE roller set already, the length should match the pump drive from your roller kit, all you do is drop it in and button everything up. If you have a regular timing set, you have one last step. This is probably a good time for a new set if you need to do that too. Remove your crank timing sprocket, measure it's overall length. You are going to cut the oil pump drive off it, this is best done on a lathe to protect the timing sprocket teeth and make a square cut, but again...improvisation possible. Note that only remove as much material as needed so that the pump drive you created above and the 'new' timing chain drive are the same overall length as what you started with. Then you re-install your timing chain drive section, the pump drive sections, and re-assemble as normal. The issues with this method is that anybody running a double roller is basically out of luck.... But I think I have a solution for that as well, and you can get a double roller for a lot less than the series 2 rollers cost! I need to verify it first, but I can share what I do know. Simple. Cut the end plate off the camshaft. Use it to make an adapter to fit the cam sprocket from the GN to the camshaft of the series 2. You can see that while it has adequate clearance to the stock series 2 oil pump (much more than the series 2 rollmaster does), it would be tight with the added 1.8mm to the oil pump. The ZZP machined oil pump cover is 0.6mm thinner, and the extra gasket would get you another 1mm. So, it's really close, but until I measure and test fit I won't know for sure. Last edited by MattStrike on Fri Sep 14, 2018 2:06 pm, edited 1 time in total. Why not just use a single stage external pump? And do away with the front cover pump all together? Aren't those like $700? Also then you'd have to deal with blocking off and teeing into the existing oil system and figure out how to mount it. Seems like something one could easily drop a grand into between the pump, fittings, lines, etc. This is something I can do to my daily and not wreck it or my wallet. They can cost that much, but there are ones that are much cheaper. Modifying the front cover seems like a lot of work for minimal gain. Especially if you aux feeds for a turbo(s) or spring oilers. Having the ability to get the exact pump section size would be the benefit. The point of this is you aren't modifying the front cover, simply adding a spacer. You are correct that having the ability to get the exact pump flow rate needed per application is best, but it's not like the issue I'm trying to solve is to double the pump flow rate for a full on drag car. The series 1 pump by volume is 18% larger - I was bored and modeled both of them in CAD to check my measurements - which means an 18% increase in flow rate. Probably way more effective than changing out the oil bypass valve spring all things considered. Not what I'd consider minimal. Okay, let's back up because I'm sure I missed somthing. Why is it felt that more volume is needed? How much volume is needed? Or felt needed. At 750rpm, at 2500rpm, at 6500 rpm? What volume per rev did you calculate from the current pump? It's Sunday night, a few beers won't skew my thought process, right?... I'll have to get back to you about the specific volume numbers, they are stashed on my work computer. Why is more volume needed? The one specifically in question is the one in my SSEi. It has been rebuilt, bearings plasti-gauged on the low end of spec during assembly, but to echo the words of my engine builder "10 PSI per 1K RPM" is "Normal". So, that means that at idle, my engine makes about 7psi fully heat soaked. Guess what happens at 12psi? The guage cluster decides the oil pressure is too low, the gauge drops to zero, and it starts dinging at you. But that's probably OK, I guess, considering from the factory the 3800's make north of 40psi at idle. What's your oil temp at full soak? In the sump or in the valley? What weight oil are you using? Don't have oil temp data (yet), but I did add a heat exchanger to cool oil after the bypass filter. I know that adding the turbo makes the car run hotter during cruising, car has a 160 thermostat but over 65F outside it's a 1 for 1 over the 160 (ie, 80F outside and the car runs 175F). That might be attributed to having an intercooler in the way and the tiny grille the '93 has. I use Rotella T4 15w40 or Rotella or Mobile One 5w40, whichever is on sale. All my cars, except the Cadillac, run T4 15w40, because I can usually get a 2.5gal jug for $22 or something like that. The one time I used 10w30 per the 'recommendation' it didn't really make a difference. Note than I've blocked off the balance shaft oil passages completely, so there shouldn't be any oil being used there, and I have oil restricted push rods, and the oil pressure kit, etc. I suspect that from the factory the tolerances are about half of what the acceptable tolerance for a rebuild is. I don't know how else they can get 40psi at idle and a rebuild gets ~10. I have a good short block set aside for this car if I can't get the oiling issue worked out on this one, but if something as simple as the increase in oil pump volume picks up enough flow to hold 15psi at idle that's good enough for me. Whatever engine I do this to, the extra oil volume certainly won't *hurt* anything. Yep agreed on the pump volume helping, it just seems strange how low your pressure is at soak. Am I correct in assuming you have an unrestricted -4 hose feeding the turbo with oil? Is the center assembly coolant cooled? What's the return line size? What's your total oil system volume? Do you know what your clearances are off hand? Oil line is -4an, I want to say I did not end up with a restrictor, I honestly have to pull the line to check. I think the HY-35 needs unrestricted oil flow, it's a journal bearing turbo not ball bearing. Return is -12an, honestly limited by the outlet flange on the turbo to even try to go bigger, though I plan to make an adapter to get the drain up to -16. Oil capacity is about 8 quarts total if I change both filters. I've toyed with the idea to re-vamp my oil system, pulling the turbo off the main oil circuit and on the electric side. I need a second oil pressure guage attached and working to monitor, would make for a better turbo timer I guess. I had the issue before I put the turbo on. I had the NIC cam so ended up bumping up the idle to about 900rpm and it seemed to keep it out of the dead zone in the cluster, so it's not that adding the turbo caused the issue either. So I ended up pulling the trigger on the waterjet parts. I had to get 4, because the thickness of the spacer meant they have to custom order the material, combined with the minimum order requirements. I'm keeping two, one for the prove-out and one for the Bonneville. One is already spoken for, which leaves one spacer available - PM me if interested. crank timing sprockets from series one and series two, cut off the nosedrive so you can mix and match the series 2 timing drive to the series 1 oil pump drive. As soon as parts get here I'll update the writeup with pictures. If this works well I bet a lot of other turbo guys would be interested in them too. I'm definitely interested to see what happens, I'm keeping my old L36 to build a turbo S truck with.